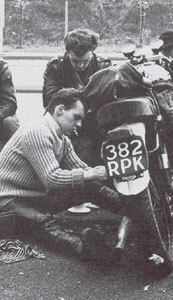 In the late 1950's a very influencial biker cult known as the Rockers started in England. The time was right. Post WW-II England saw the end of rationing. People had money to spend on bikes. The new ring roads around cities could double as speedways and the trucker cafés on these roads were meeting places. Further ingredients -according to Johnny Stuart in "Rockers! 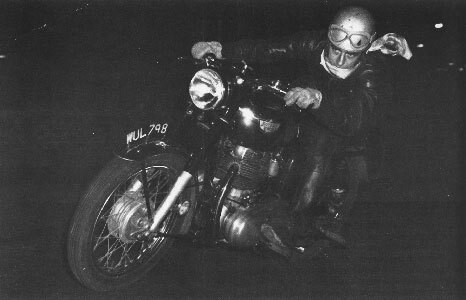 "- were "a love affair with bikes and speed, a very English interpretation of American 'glamour', a sense of alienation from the 'worthwhile goals' of straight society, (...) and (...) rock'n'roll music". Typical rocker outfit, black leather and a white scarf. 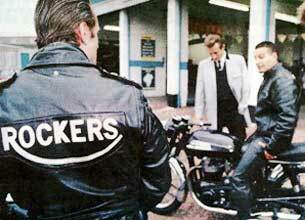 Rockers wore leather as a Bike Boy's armour. Typical for them was the white scarf, tightly wound around mouth and neck. 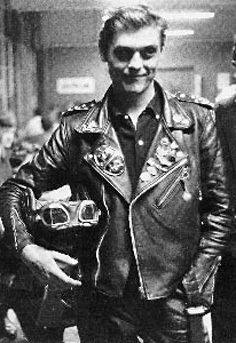 Although the 'official' dress code for the Rockers was completed with a pair of Levi's jeans, many of them wore leather pants instead, to match their leather jackets. Leather jackets and leather pants, the latter being a little less common. 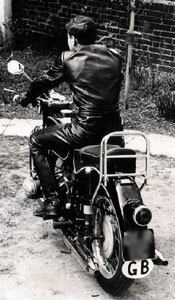 The Rocker movement was to be very influential, not only for the way the general public looked at leather but also for later youth sub-cultures like punk in the 1970's. 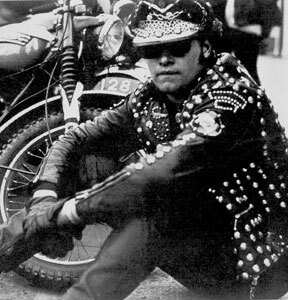 The masculine Rockers image of black leather, their lifestyle and their symbols were copied many times by very different groups. 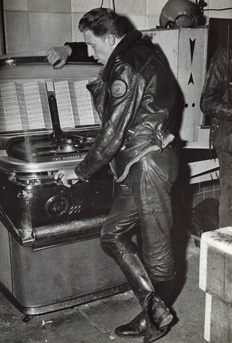 We believe they were one of the reasons rock and pop stars in England in the early sixties began to wear leather, who in their turn made it possible for many young gays to see leather. 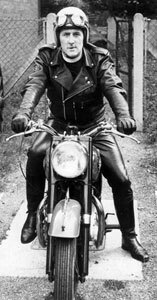 But many gay leather fetishists were also directly influenced by their masculine look as well. They carefully copied the image of the manly Rockers, including the white socks folded over the top of boots and the white scarf that the Rockers themselves had taken from the World War I aviation pilots. Rockers in the 1950's and 1960's. 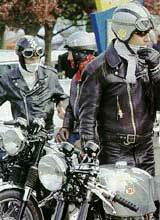 The Rockers of the nineteen fifties and sixties were very close. But during the nineteen seventies the movement as a sub-culture had almost vanished. Then in the early eighties a few remaining Rockers organised reunions that would become very popular. 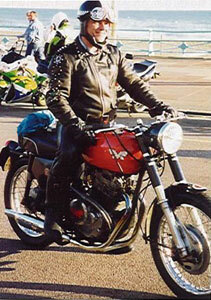 The reunions are still dominated by motor bikes and black rebel leather! Many of the visitors are far too young to have been around in the early days. Apparently the rocker movement is still appealing to new members. The three pictures above were taken at the 1998 reunion in Brighton. The photographer kindly donated them to us for this site. 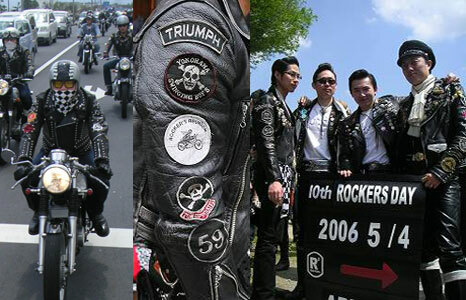 One of the versions of the Rockers sub-culture still exists in Japan. The annual Rockers Days there are visited by motor cyclists with all the classic symbols the original English Rockers had. The rocker movement is also appealing to people in a different time and with a different cultural background. 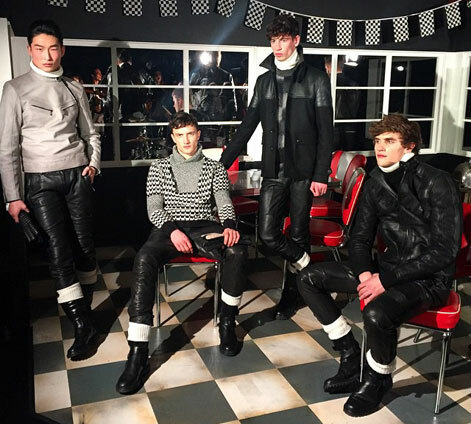 For their winter 2015 collection, the fashion brand "Belstaff" drew inspiration from the rocker movement. The photos and a video to accompany the collection of leather clothing are very obviously styled to resemble the old pictures of the rockers in their café.